With a heavy heart, I have decided to put my “Lime Light” up for sale. New circumstances do not leave me with much free time, so, as last year, my beautiful ship is barely sailed. She is a Beneteau 405 (=Oceanis 40), built in 1994, extremely well cared for and with extensive equipment, no repairs or maintenance backlog. Between 2006 and 2015, the boat has been considerably modernised and equipped, such as with electronics, a 3000W-inverter, batteries (4 x 110 Ah + 1 x 72 Ah), battened mainsail with lazy jacks, furling genoa, shrouds and stays, keelbolts, rudder bearings, shaft seal, epoxy osmose prevention, anchor chain, teak, bimini, cockpit cushions, conversion to LED a.o. During the last hardstanding period in autumn 2015, around 3,500 Euro was spent on maintenance, a list of works done can be provided upon request (works done between 2010 – 2015 ca. 39,000 Euro; est. amount spent by the previous owner in 2006 – 2009 ca. 50,000 Euro). The engine is a well maintained “Volvo Penta MD22 LB”, 55 HP, from 2002 with approximately 2,800 engine hours. ​Lime Light is equipped for long hauls, ocean passages and life on board. Examples: gennaker, spinnaker and storm jib like new, HF radio, Navtex, AIS transponder, radar, 2nd chartplotter inside, DSC VHF with additional handset outside, 2 handheld radios, EPIRB, preparation for placement of a water maker, 560 litre water tanks, 2 solar panels, wind generator, large fridge, additional shelves below, large bimini, high-grade foldable “Pischel Bolero” dinghy on davits, good as new 5 HP “Tohatsu” outboard engine (approx. 35 engine hours). The boat is a 3 cabin version (owners bow cabin, 2 aft cabins), large heads with shower in bow, smaller aft heads with shower. The boat is registered in Germany, unfortunately the EU VAT proof is not available. 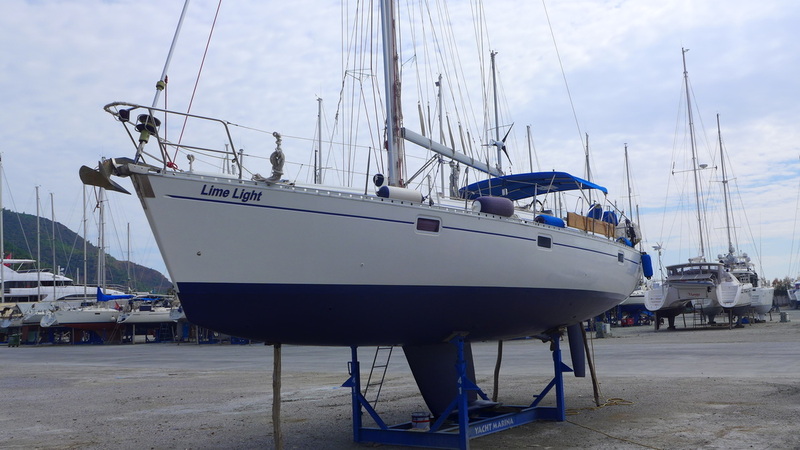 Lime Light is berthed in Crete until April 2016, after which I plan to take the boat to Mallorca. Sellling price 59,500 Euro o.n.o. Travel expenses to view the boat will be refunded up to 500,- Euro in case of purchase. I would be paying the berthing costs in Crete / Aghios Nikolaos and Mallorca / Portocolom up until July 2016. I am also glad to transfer the boat to any other harbour in the Mediterranean upon request.